When a group of enhanced human beings murders his entire unit, this U.S. Army Special Operations Commander not only survives but vows revenge on the former billionaire superhero he feels is responsible. What starts off as a gritty combat action story takes a surprising turn that helps make 'Aberrant' an exciting new entry in "superhero" comics. It really has more in common with 'Watchmen' in the way it tackles the ugly side of a reality with enhanced humans aka "aberrant freakshows." Government secrets and backdoor deals played a part in these human experiments going rogue and killing his team. Now, Major Colbrenner, who mysteriously survived the attack, will stop at nothing to get those responsible. The resemblance to 'Aliens' is undeniable but what separates 'Aberrant' from your typical mutants run-amok amid government conspiracies is the emotion at the center of the conflict. Major Colbrenner truly mourns the loss of his men and reminisces about them. Sure, this is a heightened version of a revenge tale but it's totally not without a heart. It's not the testosterone-fueled shoot'em up you might expect but there is a method to writer Rylend Grant's madness. There isn't a female character yet which does make this a male-driven comic but it is only the first issue so we'll see how this world opens up. Zsombor Huszka and Iwan Joko Triyono handle the art duties and they create a dark noir-like atmosphere full of shadows and moody panels. Huszka style is gritty so the faces can be grainy and hyper-abrasive but the pacing is so brisk and on time the story flows fast and exciting. Triyono's colors tend to be monochromatic in earth tones give it an aged look like the story took place a long time ago. Nonetheless, it all works to create a bleak, dangerous and serious story with a lot at stake. 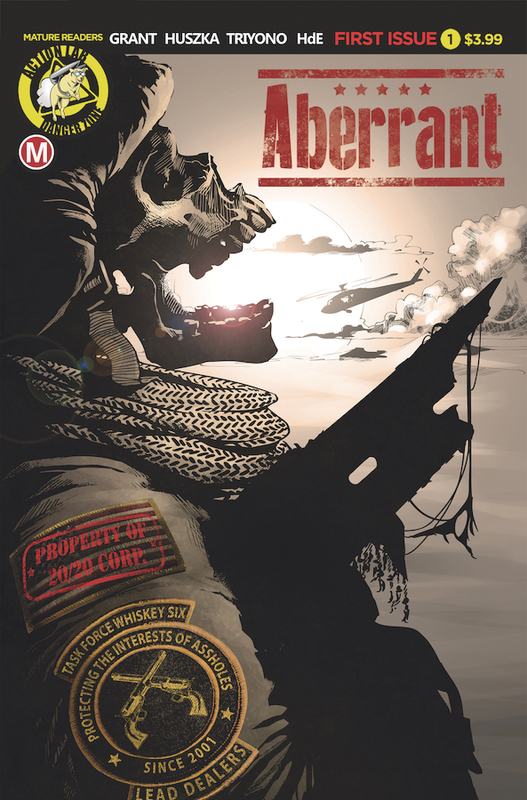 'Aberrant' lives up to its promise of a "one-man war" and offers a deeper conspiracy. It's off to an explosive start that's intense while introducing a new spin on superhumans. If you like revenge tales, military thrillers, and superheroes, 'Aberrant' has it all. Give this series a chance.